How to raise healthy happy bunnies: Helpful Tips, Links, and Info that will make you and your bunny happier. Welcome! I hope you find some helpful, beneficial, & interesting things to learn about your bunny, both to help you and your special little friend. These will include food tips, care, links, ideas on housing, and more! 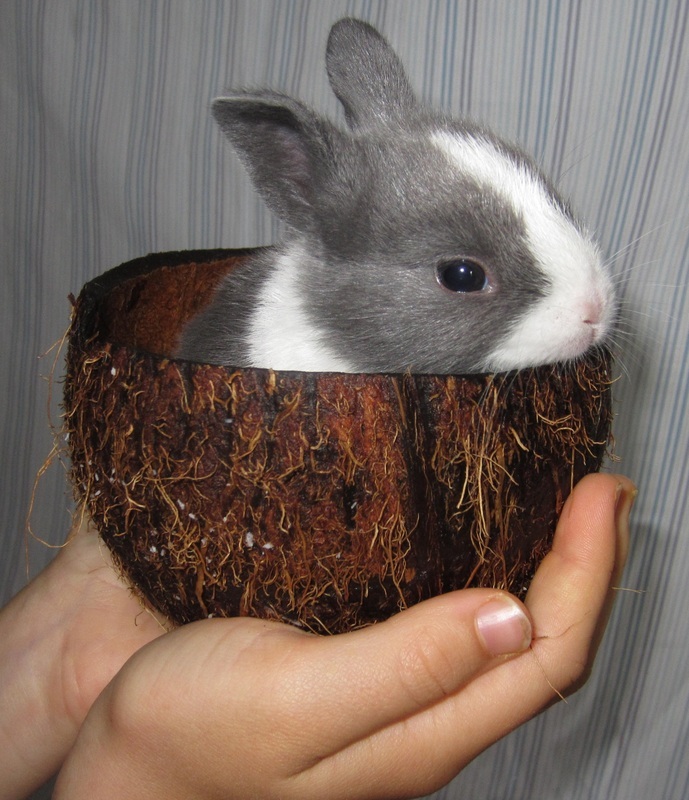 Please note: Most of the tips here are for Dutch rabbits, or other short-hair breeds. Angora rabbits need different types of care than other breeds, due to their unique wool etc. Let me know if you have any questions or comments by leaving a note on Feedback! I'd love to hear from you! All links are only suggestions, they are my own private opinion. Here are some helpful links that I have enjoyed or recommend! I've found this link helpful for trying to help my bunnies naturally, like with ear mites, or something small like that. Here is what I've used in the past before I got my new software, for printing off Pedigrees for Dutch Rabbits. You may need to adjust the zoom to print at 150%. This is the "official" Dutch Rabbit website. Neato! And Awesome INDOOR Bunny Housing *for Dutch Rabbits*! Please be aware than Angora's need a "grate" or wire bottom on their cages, so that they are not in their droppings and bedding. Bass Equipment located in Monett, MO, also carries great transport carriers, housing cages, and other necessities. Tips on housing, food, care, grooming,& more! Rabbits generally like an 18x36", 24x24" or 32"x36" inch cage for space. For indoor or outdoor containment, they need to be kept cool in the summer. If indoors or in your garage, during the summer freeze water bottles and place them in their cage. If your bunnies are kept outdoors, use both frozen water bottles (change 2 times a day) and a fan is also very helpful. A/C if possible is recommended. Keeping your bunny cool is one of the most important parts in caring for it. Also keep plenty of water at their disposal. Sometime bunnies like to chew on Ice cubes, I like to offer them to mine as a "treat". Mine also love whole oats. I also love to give them Applesauce, Apples, Mangoes (fresh in small amounts), carrots, they loooovee fresh peaches, and most dark colored greens like parsley (fresh), Lettuce, Kale, and Mustard Greens. Be careful to feed only small amounts, remember these are "desserts", not main dishes. ;) The Key to treats in a healthy diet is Balance and Moderation. Feed is highly important to maintain a healthy happy bunny. I *highly* recommend Manna Pro 16% or 18% and Penpals 16-18%, or Country Acres rabbit pellet. For Local Customers, you can get Country Acres at Fair Grove Feed N' Trade in Fair Grove MO or Gorden's Feed stores in Marshfield and other SWMO areas. However, Manna Pro 16% or 18% and Penpals 16-18% can be purchased from any Purina carrier. (i.e. Orschlens) I generally feed about 3/4-1 cup per rabbit per day. I also like to feed lots of fresh hay, whole oats, BOSS (black oil sunflower seeds) and a little greens (clover is great) in spring. You need really need to watch the heat for your bunny indoors or outdoors, especially if your bunny is outdoors. I like to freeze water bottles (i.e. 2 liters, or aqua water bottles like from a store work great!) and offer them to the bunnies once or twice a day. Also, fans and maybe misting them will help with keeping them cool. I don't recommend taking your bunny with you many places in your car, as heat alone is highly stressful. Too much stress can hurt your bunny, and I can't say that enough. Air Conditioning or controlled climates are recommended and encouraged for any rabbit, but especially for English Angoras. Now this is slightly new to me but can save the life of your bunny. When you bring your new bunny home, ask the previous owner/breeder if they have had the bunnies on well water of chlorinated water. Often chances are that the bunny has been raised on Well Water. If you live in the city, any city that might have chlorinated water systems, I suggest following the following thoughts to keep your bunny safe and happy. Adult rabbits may not need to have this done, but young bunnies (anywhere from the age of 6-17 weeks) should get this extra care. Tips for if you live in the city, how to adjust your bunny to tap water. Day 1. After bringing your new friend home, when you offer her food and water, give her/him bottled water. No water out of the tap. Day 2. Offer your bunny Bottled water again, but this time add just a little tap water to it. Continue step 2 until your bunny is fully weaned onto tap water. It should take you at least 1 week, I recommend doing it for 2 weeks if your bunny is under 10 weeks old.